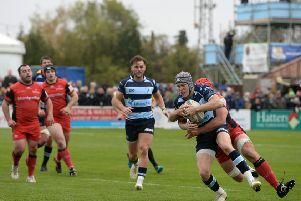 Bedford Blues head coach Mike Rayer identified ‘poor skill’ as the reason his side lost 17-26 to Nottingham at Goldington Road on Saturday afternoon. A bumper crowd of 2,517 people turned out for the Blues’ last fixture of the season, but the hosts were unable to end their campaign with a win as the visitors secured the victory thanks to a dominant first half display. Bedford were much better after the interval –epitomised by two tries from Pat Tapley – but they couldn’t come from behind and were forced to face defeat for the second week in a row. Speaking after the match, Rayer said: “It was down to poor skill, simple as that. “If you look at the first half we made so many errors with the ball in hand and we could never get a shot off, we just couldn’t get beyond first phase. “They are skilful players out there and I’m lost for words because it’s not like we don’t do a lot of skill practice; we just kept dropping the ball. He continued: “We dropped the ball three times from quick tap penalties today and you can’t get any continuity from that.